Description CONTRO.LUCE is the new album from Italian Dark Masters Canaan. It will probably lift some eyebrows, not only because it's entirely sung in italian, but also because it's hardly comparable to what the band has done before. 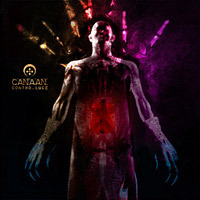 The concept of "dark music" still fits, but it's way too narrow and restrictive to describe what CANAAN year 2010 are playing. Cold Wave ? Ambient ? Dark ? Ethnic music ? All of these and something more. Now take a deep breath and sink into the shadows the band creates through the 71 minutes of this lightly dimmed abyss. A journey from ashes to dust. Track-list Calma / . / Onore / . / Noia / . / Terrore / . / Ragione / . / Oblio / . / . / Lascivia / . / Umiltà / . / Concupiscenza / . / Esitazione / .